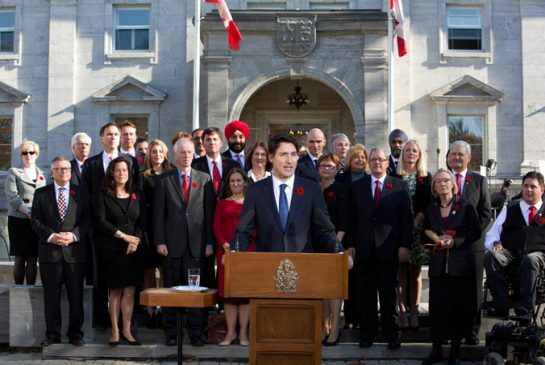 With the advent of our new federal government in Canada, Prime Minister Justin Trudeau followed through on his election promise of gender parity in cabinet. For the first time, an equal balance of women and men was achieved, and it was conscious and deliberate. While, encouragingly, it seems like a lot of people are on board (but that may be the view from inside my shiny feminist bubble, aka, circle of equality valuing, open minded people), for everyone who just understood the need to make promoting women in politics a conscious and deliberate priority, there have been many others complaining about gender quotas and “merit.” In light of this topic, here are a few observations and key points from how I see it. 1. Promoting the success of women in politics is not about asking the electorate to choose women just because they are women. Whenever gender representation and balance comes up, there’s always someone who says “I’m going to vote for the person who is most qualified, not a woman just because she’s a woman!” Calm down. I have yet to encounter anyone who supports women in politics who is asking people to do this. Promoting women in politics is about undoing and working against the long standing, deeply entrenched history in which 1) women couldn’t vote 2) women couldn’t or didn’t run and 3) women run but still less than men. It’s about acknowledging systemic barriers that keep women from getting to run in the first place or feeling that they could. There are lingering biases in which “we” (the nebulous masses) still tend to automatically consider men more appropriate, inclined, or qualified for political office. (Yes, I understand that you may have a few examples of some woman politicians you know who handily beat out male opposing candidates and blah blah blah sexism isn’t a thing. Lots of women are successful getting in but what about all the barriers and biases that keep many other women from putting their name forth and securing the nomination in the first place? Or ever considering themselves to be potential politicians because they were never encouraged to try it? Gender biases aren’t about, in all situations, every single person considering any given woman a less qualified politician than any given man, of course. It’s about – overall – a complex of factors causing women to have to work harder to be taken seriously, manage to make the personal, social, financial, and professional commitment to running, and how unremarkable the male politician is. We rarely have to specify the male politician – the male politician has always been there and has never had to justify his existence). In other words, advocates want more women in politics because there was nothing “natural” about their exclusion and lack of participation in the first place. Patriarchy and sexism are to thank for that. The systems that have marginalized women must be actively undone. 2. Gender parity efforts don’t suddenly exclude “merit” and qualifications. First of all, “merit” is not straightforward and unproblematic as a concept. How merit is constructed and imagined has a lot to do with privilege, access, and different value systems. Further, gender parity efforts actively resist and work against the unequal conditions that made “being a (white) man” appear to be a qualification. Gender parity efforts aren’t about taking “unqualified” women and plunking them into leadership roles; it’s about understanding that women have always been qualified, capable, and good potential leaders. It’s also about recognizing the inherent benefits of diverse representation in terms of policy and decision making. And to those who downplay the issues of underrepresentation and say there are already lots of women involved in politics - don’t prop up women’s behind-the-scenes, supportive, often unpaid labour as evidence of full participation in politics. We all know women have always worked tirelessly to help get men elected. That’s nothing new, and it doesn’t mean we are doing enough to put women in elected positions. While the PM’s response to why he achieved gender parity in cabinet was pithy, memorable, meme-able, and a veritable mic drop, it doesn’t capture the larger picture. The idea that the year alone necessitates efforts towards fairness sort of presumes that we live in a society in which gender quality has been reached, sexism is over, and we have to construct our political representation to reflect that. But since none of that is true, I’d say gender parity in cabinet matters to set an example for the larger society we want to create. Caucuses and cabinets should represent the diversity of the actual population. Women belong there not just because the year, presuming the present moment is always more progressive than any given moment in the past. The reason is, truly, because it’s long overdue. Women didn’t become capable of political office in 2015 – 2015 is just the year a Canadian PM decided to consciously acknowledge sexism in politics. 4. Working on creating spaces for women isn’t taking anything away from men. Reserving 15 seats (half) for women isn’t taking positions from men. The presumption that men belong there, or “own” those spots, is the legacy of male privilege and entitlement. Whenever women make gains, people (often men) complain about what men are losing, rather than considering how men’s presumed appropriateness and qualification for political office unfairly benefited them for eons. When we talk about gender in politics, we squabble about how terrible it would be for affirmative action to get women elected unfairly. Yet men’s genders have unfairly allowed them to succeed, rise to power, and earn more money since...forever. 5. There was a quota for men, too: it was 15. While it’s not as much discussed in relation to Trudeau’s cabinet, the gender quota worked both ways. The aim was to make it balanced, not wipe out men. There were 15 seats for women, and 15 seats (and the top job, Prime Minister) for men. So it looks like men benefited from a quota too. 15 seats were saved for them. Who knows – without that implied quota, presumably based on “merit,” perhaps there would have been more than 15 women appointed. Imagine that.